Virtual full allows you to back up forever forward incremental backup chains to tape. The forever forward incremental chain always keeps on disk one full backup followed by a fixed number of increments. The full backup is constantly rebuilt: as new increments appear, the older ones are injected into the full. Unlike disk backups, tape archives are static: tape jobs cannot rebuild backups once they are written to tape. Also, the standard backup to tape scheme (archiving new restore points during each tape session) cannot be used: the tape archive would have one full backup and an endless chain of increments all of which would be required for restore. To adapt the forever forward incremental chains to tapes, Veeam Backup & Replication uses the virtual full. The virtual full mechanism creates a periodic synthesized full backup on tape. The periodic fulls split the forever incremental backup chain into shorter series of files that can be effectively stored to tapes. Each series contains one synthesized full backup and a set of increments. Such series are convenient for restore: you will need to load to the tape device only those tapes that are part of one series. The virtual full does not require additional repository disk space: it is synthesized directly on tape on the fly, when the tape job runs. 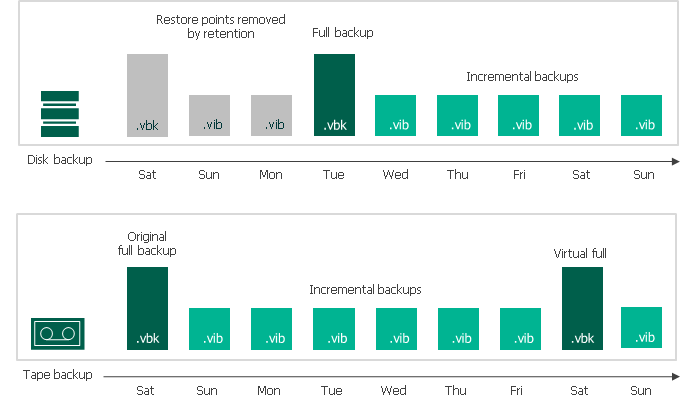 To build such full backup, Veeam Backup & Replication uses backup files that are already stored on the backup repository. The virtual full is enabled automatically if the source job has no scheduled full backups. You can schedule the virtual full on a specific day (or days) of week. This day indicates the day for which you want to synthesize full backup of the source machines. The virtual full does not necessarily need to be scheduled on the day when the tape job runs. When the tape job starts, it synthesizes the source machines state as they were on the chosen day. For example, you can set Friday as the virtual full day, and schedule the tape job to run on Saturday. The tape job will not run on Friday. On Saturday, the tape job will copy blocks of data to reconstruct the state of the machines as they were on Friday (or, if no backup is available for Friday, the closest day preceding Friday). You can customize the virtual full schedule according to your needs, although you cannot disable the virtual full if you back up the forever forward incremental backup chain. Also, you cannot create more than one virtual full a day. The source job configuration must not have scheduled synthetic or active full backups. If it does, the virtual full will be disabled even if configured in the tape job.